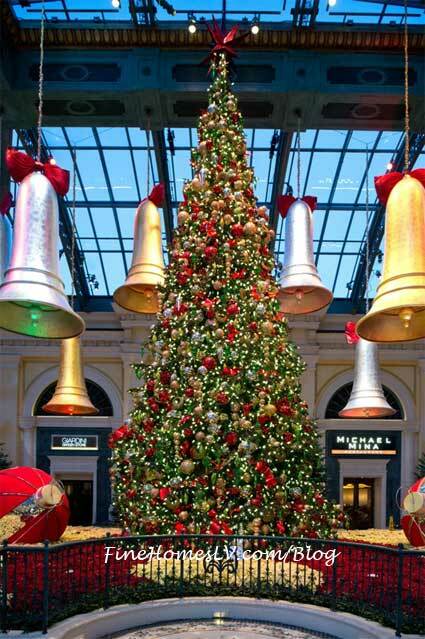 The stunning centerpiece of this exhibit is a stately 45-foot tall Shasta Fir, the largest holiday tree ever displayed at Bellagio. The majestic tree is decorated with more than 2,500 assorted ornaments and glows with 10,000 white energy-saving LED lights. 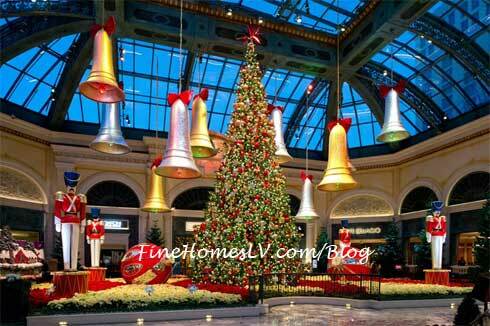 Hung overhead are silver and gold bells while four grand toy soldiers revolve around the outskirts of the holiday tree. New to the display this year and created by Bellagio’s renowned pastry chefs is a charming chocolate village, where no detail has been overlooked including the LED lights shimmering through their shutters. 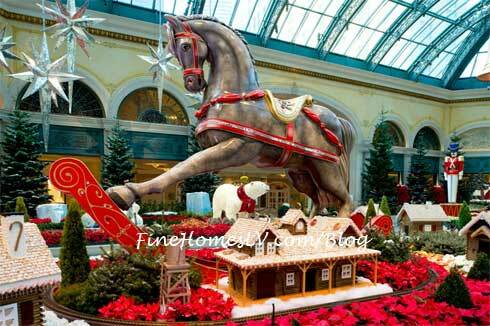 Nearby, a seven-foot-tall, custom-sculpted rocking horse stands in the midst of the village. 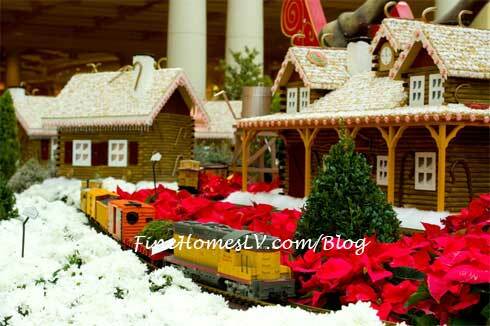 Whirling throughout the display are two motorized toy trains equipped with live cameras where guests can view what the train sees on its travels on four nearby television monitors. In the North Garden, a waddle of 11 faux baby penguins frolic in the snow and skate around an arctic ice pond. Next to the penguin pond stands an embellished gazebo where vibraphone and marimba performers fill the Conservatory with the sounds of the season from 5 p.m. to 6 p.m. nightly. From December 17 until December 25, the Conservatory will be filled with the voices of carolers from 4 p.m. to 5 p.m., another first for the holiday display. 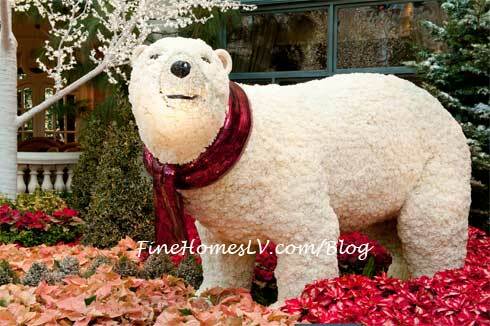 Greeting guests in the South Garden is a family of topiary polar bears made of more than 35,000 hand-applied white carnations. Papa bear stands tall smiling at those who pass by as momma bear watches over her cub floating on a swiveling block of ice.